Today's Draw Special Edition: The rune Ansuz. What do you think of the way our values have shifted since ancient times? Do you ever wish your life were simpler, sparser? Or do you think we're living our best lives right now? 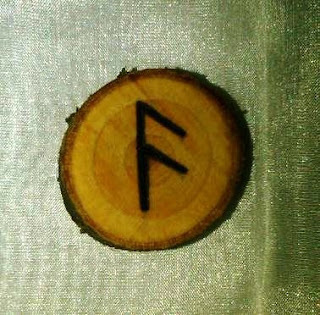 Ansuz is the rune of Odin, one of the major Gods of Norse mythology. Odin was a god of war, the hunt, poetry, wisdom, magic and prophesy. An odd set of things to be in charge of. Or is it? In a way, these ancient forms of divination give us a look back at life nearly 2000 years ago. Back then, being a warrior, hunter, poet, shaman or prophet put you at the apex of society. Today, those same positions net you middle class, at best. It wasn't that those people held all the money back in those days, they just held influence and prestige. Try telling someone you're a poet, hunter or shaman for a living today and see how impressed people are. But look at what these people are offering. They're offering the basic needs of life—food, safety, culture, healing and advice. How come we value businessmen, lawyers and athletes so much more these days? I'll tell you one thing, Armageddon hits and you won't see me running to partner up with Donald Trump for survival. I'll be grabbing myself a hunter or shaman (maybe not a poet, though). Anyway, it's interesting how our values have turned from comfort and survival to capitalism and bling. Even homeless people have cell phones and computers these days. Not that there's anything wrong with that, but when did electronics supercede shelter as a basic human need? Certainly cell phones are a safety thing. I'm not arguing that. It's not like there are pay phones anywhere anymore. But doesn't something seem weird about that picture to you? Doesn't something seem totally off overall in our worlds, where we amass stuff to keep our stuff company, and stuff it all into rooms full of stuff? Odin traveled light. All he really needed was instinct and intellect. Can't buy a cup of Starbucks for that these days, though. Before I wander off into the "when I was a girl, we walked two miles to school each day. Barefoot. In the snow." speech, let's just break it down to this. What is REALLY important to you? Most people, if their house were burning down, would go for the photos. So, on top of the basics—food, shelter, water, it's memories of loving moments. Most people given a choice between losing all their money and losing a loved one, would choose to keep the loved one. So, really, what do we do all this for? For the Lexus? For the nice neighborhood? For the electronics? I'm really the last person who should be making this argument. Though I own nothing you could call luxury or a status symbol, I have a comfortable life filled with all the tarot decks I can fit into my home. And while I have one of those undesirable houses that produces more equity than debt, I've nonetheless got a room stuffed full of stuff to keep my closets full of stuff happy. But every once in a while, something comes close to waking me up and showing me how far I've wandered from the freedom and ideals I'd rather have. I would like to be much closer to nature than modern life supports, for example. I'm fascinated with the Tiny House trend. And I would love to live a simpler, more mystical (dare I say hippie-inspired?) life. But I've become a junkie. A capitalist junkie, jonesing for my next hit from the world of retail. And I don't know if I know how to live any other way right now. How about you?